We have provided a variety of materials for your personal/classroom, and educational purposes only. The Arizona Historical Society (AHS) and its staff, provides these materials with the understanding that AHS may or may not own the copyright to the shared materials. They are not intended for public distribution. This includes any commercial reproduction, redistribution, publication, or other use by electronic means (website, social media, etc.) or otherwise is prohibited unless written permission by the copyright holder. Tucson actually began in 1776 as a small Spanish presidio, or walled fortress, a 750 feet square area, housing approximately 2 – 3 officers and 75 soldiers and their families. The square was surrounded by a 22 inch thick and 12 feet high protective wall. The gate on the western wall was made of heavy mesquite timbers and reinforced with iron. The gate opened onto the El Camino de la Mision, a highway between the San Xavier and the San Agustín missions. When Mexico gained independence from Spain in 1821, Tucson hoisted the new flag of Mexico. By 1830, Tucson had grown into a Mexican village and had spread beyond the presidio walls. Tucson was primarily composed of one-story, one-room adobe houses with dirt floors. Buildings with few windows or doors, and rectangular shapes resulted in an unadorned and bare street facade. At the time, the Santa Cruz River provided a daily, abundant water resource and irrigated fields that were filled with squash, grain, beans, peas, chilies, pumpkins, watermelons, pears and pomegranates. The Mormon Battalion captured the town in 1846 during the Mexican-American War, but did not remain and occupy it. In fact, it wasn’t until 1856 that the Mexican soldiers withdrew. The first Americans entered the area in 1854, (Gadsden purchase), but it was another decade before a significant Anglo population existed in Tucson, and American women didn’t arrive in the region until 1872. The Butterfield Stage Line brought mail and passengers to Tucson in 1858; it was discontinued after two years. When Arizona became a territory in 1863, Tucson continued to be the military headquarters of the territory. From 1867 – 1877, Tucson served as the capital of the Arizona Territory; it had previously been in Prescott. By 1877, Tucson was incorporated as a city. Few of the buildings were finished in plaster; the city had unpaved, unlit streets, no electricity, no sidewalks, and no public works, but all were soon to come. The Pima County Board of Supervisors ordered a map made of the town and required the town to rename Spanish language (calles) streets to honor prominent citizens killed by Indians. The town also enacted a homesteading plan; village lots were distributed for free if the homesteader spent $100 to improve the lot, and if they lived on the property for at least 6 months. In 1879, Pima County Bank accepted its first deposits. The year 1880s marked the beginning of a big change for this one-time Mexican village. The Southern Pacific Railroad arrived in 1880, and the Indian wars were concluded with the capture of Geronimo. New industrious immigrants arrived, bringing a willing labor force, new ideas and the latest American architectural style that competed with adobe as the main building material. The 1870s were a time of great change for Tucson. People from all over the world and other parts of the United States came to the territory to seek their fortunes. The 1870 census included immigrants from Mexico, Ireland, France, Switzerland, Poland, England, Germany and the West Indies. 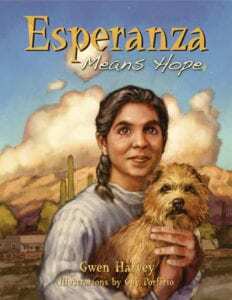 Some of the newcomers appear in Esperanza’s story, including Estevan Ochoa who was born in Chihuahua, Mexico; Jacob Mansfield, a Jewish merchant from Germany; Lionel and Barron Jacobs, Jewish merchants whose father came from Poland; Sister Mary Monica Corrigan of Irish heritage, originally from Canada; Bishop Salpointe, a Frenchman; and Sam Hughes, a Welshman. There were also a handful of former African American slaves, such as barber, Charles Glasco, who left the South as free men after the Civil War and came west, seeking better lives. Most of the newcomers were young, adventurous men and many, such as Alexander Levin and Sam Hughes, settled in Tucson and married local Hispanic women. It was less common for soldiers to marry locals, but Lt. McKinney’s story is plausible. During this time also, plenty of real no-account drifters such as Bucky and Jack (fictional characters) also came through Tucson to make a quick buck. Many didn’t care if their activities were legal. Cattle rustling, always an issue became a real problem. Statesmen, army officers, gamblers, lawyers, strangers and others enjoyed meals together at the Shoo-Fly Restaurant in Tucson owned by Mrs. Wallen. The restaurant had both good food and flies, but they did try to shoo the flies away. 12 wholesale and retail stores that made over $10, 000 per week. 12 – 15 smaller stores that included a drug store, groceries, pawnshops, and four restaurants. Bailes, Spanish for dances, were held and enjoyed by all. Mothers accompanied their daughters to the dances as chaperones. Lt. McKinney (p. 36-37) discovered this tradition when he asked Mariá Elena to dance, and he had to dance with Nana first. Musical instruments at the dances included the following: a fiddle, a kettledrum and sometimes a harp. At the Ochoa’s party there was also a violin and a guitar player. Entertainment in the city included an occasional traveling circus with ropewalkers, jugglers and tumblers who visited Tucson from Mexico and marionettes (puppets) and Punch and Judy Shows. San Xavier del Bac Mission was founded in 1699 by Father Eusebio Kino, a Jesuit missionary-explorer. It was one of a chain of 25 missions founded by Padre Kino from northern Mexico into present-day southern Arizona. Father Kino is remembered throughout the Southwest with memorial honors – streets such as Kino Parkway in Tucson and with statutes – one in Tucson, one in the Wesley Bolin Memorial Plaza near the Arizona State Capitol, and one in front of the Tucson Arizona Historical Society – as some examples of his impact on the region. San Xavier Mission was named a National Historic Landmark in 1963. While a Spanish architect designed the mission, it was built by the labor of Papago Indians, today known as the Tohono O’odham Nation. San Xavier Mission is nicknamed the “White Dove of the Desert” for its brilliant white color. It was constructed of adobe block coated with a plaster of lime, local sand and cactus juice. This wash (paint) gives the mission its glowing white color. Construction of the current church began in 1783 and was completed in 1797. Arizona was part of the Spanish Empire in North America at the time. San Xavier is the oldest European structure in Arizona and is considered a national treasure. The mission’s interior is filled with original statues, frescoes, carvings and mural paintings displaying a mixture of Spanish and Native American artistic designs. Its massive, carved mesquite-wood doors add to the awe and beauty of the building. The mission is located 9 miles south of downtown Tucson on the Tohono O’odham Indian Reservation. The Santa Cruz River runs near the mission. About 200,000 visitors come to the mission each year to view its Spanish Colonial architecture. In 1821, Mexico gained its independence from Spain, so the mission became part of Mexico at that time. When the Gadsden Purchase made the area south of the Gila River part of the United States, it became a part of the Arizona Territory. At one time, the source of water for Tucson residents was El Ojito Spring; it is no longer there. The spring slipped beneath the earth, diverted by an earthquake in 1887 and eventually drained by the ever-increasing population of Tucson. For many years, the spring gave a year-round supply of water. It supplied the soldiers in the presidio with water before wells were dug within the fort. Guards were posted to protect the people from the Apaches when they were gathering water and washing clothes at both the El Ojito Springs and the Santa Cruz River. An Irishman, Martin Toughey, made a business of delivering water in canvas bags, that he tied to his burros, to the residents of Tucson for a penny a gallon; later two other enterprising fellows used a two-wheeled cart for delivery and sold the water for 5 cents a bucket. In the late 1800s, “Simpson Baths” took the water from the spring, heated it and provided a bathing opportunity for the men of Tucson. All social levels of men, rich and poor, frequented the baths, conducting business while soaking in the metal tubs. Women were not allowed to bathe there; they had to haul water to their homes and heat it themselves. The public bathhouses (with zinc or tin tubs) cost 25 cents for a weekly bath; water was considered far too important to use for bathing more than once a week. In 1873, Hiram Stevens erected the first windmill to pump water from the wells. Windmills were soon erected throughout the town. In the 1880s, W.C. Davis installed Tucson’s first personal bathtub in a Congress Street home. In Esperanza Means Hope, Alexander Levin was introduced as a guest at Señor Ochoa’s party. He is described as a “huge man with a bristling black beard and as a German Jewish immigrant … [who] ran Levin’s Park, one of Esperanza’s favorite places.” Esperanza dreamed of tasting the ice cream from the saloon, but she knew her family couldn’t afford it. Levin’s Park was also mentioned in the story as the site of the 1876 Centennial fireworks display in Tucson. Levin was a brewer by trade. Levin’s Park is also worthy of some description, having been for many years a very popular resort in Tucson. Here the San Augustine fiestas were held, celebration of both American and Mexican independence, and was the scene of many a revelry (partying). It was the constant care and pride of Alexander Levin, who set out the rows of trees, and watched their growth from slender saplings to trees of great height and size; the entire area of the [seven acre] park was shaded by their foliage. He planted eucalyptus, pepper and cottonwood trees as well as many varieties of roses and other flowers. Benches and tables were provided for the guests (in shady places), and refreshments furnished from a restaurant on the grounds. Levin was the first in town to introduce ice as a luxury item. A high fence made it safe from improper intrusion (disturbance), and a gatekeeper held the premises in charge. A skating rink, shooting gallery, bowling alley and dancing pavilion were prominent attractions. Levin built Park Hall with a 2000 seat capacity, to accommodate live theatre and operas. Music was discoursed (played) every evening by a first-class string band, and concerts every Sunday afternoon were much frequented. Its pleasant shade and cool breezes were blessings in this village on the Santa Cruz, and a visit to Tucson was not considered complete without taking in the old mission, Levin’s Park and Fort Lowell, which divided honors with the park as a resort for the social set of early timers. In Chapter 7, (page 60) Esperanza enjoyed her first taste of ice cream. It was favored with cinnamon and vanilla and served in a long-stemmed glass dish. In the mid-1800s in the United States, ice cream street vendors would sell ice cream in small glass containers called “penny licks.” The sweet treat cost just a penny, as the name implies. “Penny lick” glassware had a thick bottom with a slight depression at the top that was filled with ice cream. Although the glass made it appear as if the glass were full of ice cream, it was an optical illusion. In fact, the glass only contained a “lick” of ice cream. People would lick the ice cream and then return the glassware to the vendor who would wash out the container; eventually, concerns about health issues connected with the non-sterilized glasses, brought an end to the practice. Although no one is 100% certain who first resolved the problem related to the penny lick glassware, eventually paper cones and then a type of pastry cup or pastry cone was invented to hold the ice cream. The first maker of ice cream in Tucson was an Italian who came from Sonora, Mexico. He sold a quart of ice cream for $5.00; that is more than is paid today for a similar amount of the dessert. Ice cream would have been an expensive luxury at the time, given that a laborer generally only made $1.00 per day. Dolly Madison created quite a sensation when she served ice cream as a dessert in the White House during the second inaugural ball in 1812. Italo Marchiony baked an edible waffle cup with sloping sides and a flat bottom to serve his ice cream to Wall Street customers. He patented this idea in 1903. In 1843, a housewife, Nancy Johnson, invented the hand-cranked ice cream churn. She sold her patent for $200 to a Philadelphia kitchen wholesaler. El Dia de San Juan or San Juan’s Day is a celebration of water and its importance to life in the desert. The fiesta has a rich Tucson history. The original Tucson celebration occurred over 130 years ago. It was revived as a local community event in 1998 and has been celebrated annually since then. It is a cultural fiesta associated with the patron saint of water, St. John the Baptist. It was originally celebrated to ensure that rains would provide plentiful food harvests. A legend states that in 1540, Francisco Vasquez Coronado, a Spanish explorer, stood on the banks of the dry Santa Cruz River praying for a badly needed rain because animals, plants and crops were dying. When it began to rain, Coronado declared the date of June 24th as the traditional start of Arizona’s monsoon rains, “season of el chubasco.” Thereafter, the date has been a combined celebration of water and of St. John’s birthday. In the old days flowers were thrown into the river and into the irrigation ditches. Even though the river and the irrigation ditches or acequias are gone today, children still throw flowers into the dry riverbed. Historically the day would begin with mass at Mision San Agustín. Then a procession would carry a statue of San Juan to the acequias (irrigation canals), where the statue was actually lowered into the water as a sign of hoped-for blessings from San Juan. Día de San Juan celebrations are not unique to Tucson. Because it was brought to the region by Spanish missionaries similar events are celebrated in other communities in the Southwest and in northern Mexico. Parades and recreational activities are included in the celebration. Mariachis, dancing, piñatas, children’s games, food and refreshments, as well as many water activities mark the day. In the past, a kind of ritual bath, not part of church celebration, was frequently performed in one of the acequias or in the river. It usually took place early in the morning. San Juan’s Day takes place on June 24th on the west bank of the Santa Cruz River at West Congress Street in Tucson. The Pima County Supervisors founded Tucson School District # 1 in 1867. There were several, short-lived efforts to educate students in the territory prior to the building of the Congress Street School. Mr. Augustus Brichta taught the first public school in Tucson in the winter of 1868-1869. It was closed after six months due to a lack of funds. The next public school was taught by John Spring in a building on the northwest corner of Meyer and McCormick streets rented for $16/month. One hundred and thirty- eight boys, the majority of whom were Spanish were enrolled in the school. Springs’ teaching duties were difficult because he had students from age 6 – 21 in his classes and had both Spanish and English speakers. School hours were from 9 A.M. to noon and from 1:00 P.M. to 4:00 P.M. Younger boys left at 3:00 P.M. In the summer of 1872, Mrs. L. C. Hughes opened a school for girls, in a house in Levin’s Park. This school was well attended and successful, but Mrs. Hughes health wasn’t good, and she had to close the school in 3 months. In 1873, Miss Harriet Bolton and Miss Maria Wakefield took charge of the school. According to records, school board trustees purchased property on the northwest corner of Congress and Sixth streets from town leader, Estevan Ochoa to build a public school. Señor and Señora Ochoa, important citizens of early Tucson, hosted the party that Esperanza and her family attended in Chapter 4 of Esperanza Means Hope. Anson P. K. Safford, second governor of the Territory of Arizona, arrived in Tucson on July 20, 1869. He would later be called, the “father of Arizona’s public schools.” He was often also referred to as “Little Gov” because of his diminutive size, but he was an intelligent and dignified leader and visionary. Governor Safford was also generous in using his own money to buy supplies for students who couldn’t afford to buy their own. In January, 1871, Governor Safford addressed the Territorial Legislature and expressed his desire for a free public school system in the Arizona Territory, so that all children, rich or poor, had equal opportunities. He asked Territorial Senator Estevan Ochoa to introduce the education bill. According to Safford, Ochoa, a respected Mexican and merchant in the Tucson community, would lend substantial prestige to the measure. Legislators appointed Governor Safford, ex-officio Superintendent of Public Instruction with no additional salary, but with $500 per year for any traveling expenses. He traveled the territory to urge the establishment of school districts in Arizona’s five counties. By fall 1875, the new public “Congress Street School” was nearly completed and the date of October 1st was set for the dedication of the school; it was built at a total cost of $9,782. It had three classrooms: the girls’ room, one for primary boys and one for older boys completing advanced lessons. The primary boys were taught Spanish and English. The curriculum was expanded for the advanced classes and included the following: reading, arithmetic, algebra, geography, spelling, English grammar, and United States history in English and Spanish translations. The school term during 1877-78 had an enrollment of 196 with 130 boys and 66 girls. With the arrival of the Sisters of St. Joseph in 1870, a Catholic school, called, “Sisters Convent and Academy for Females” was opened. Eventually, the original Tucson school grew and divided into a secondary school, St. Joseph’s Academy, and an elementary school, St. Augustine’s, for the children of the Tucson parish. By 1880, the Sisters of St. Joseph were an established factor in the life of Tucson. The Old Pueblo was finally being tied into the arterial system of the United States, and a retrospective sweep of the decade of the 1870’s offers a better perspective, perhaps, than does a detailed chronological narrative of the changes that had occurred. The happiest of all the Tucson citizens to welcome the Sisters was the Bishop of the Vicariate Apostolic of Arizona, John Baptist Salpointe, who persistently had recruited the Sisters to come to Arizona to teach. He, himself, had arrived in Tucson in 1870. The Sisters took up residence in St. Joseph’s Convent, which was adjacent to the Cathedral of St. Augustine, and it was in the convent that just a few weeks after their arrival that the Sisters opened their first school as a boarding academy for girls and a day school for boys. The first curriculum consisted of Christian doctrine, reading, writing, spelling, simple arithmetic, music and domestic science. Fulfilling the hopes of Bishop Salpointe and the Sisters, the school was soon overflowing with eager students. Three years later, the Sisters opened a school for Native American children at the San Xavier Mission. Esperanza describes San Juan’s Day on pages 42 – 43 in the book. Check to see if her description of the day matches the historic and modern day versions of the celebration. Make a Venn diagram noting similarities and differences between the historic celebration as described by Esperanza and the modern-day Tucson fiesta. Watch the video to help you. How do Tucson residents receive water today? to learn about the current municipal water system. Then write down ten ways you can help conserve water in Arizona. View Water CASA Use the center recipe and make Cinnamon Vanilla ice cream in a bag. You may wish to make more than one bag full in order to have enough to share with your friends. A “penny lick” might not be enough! Learn more about one of early Tucson’s prominent male citizens and make a biographical poster about him. Choose from the center’s gallery of early Tucson citizens. See the Jacob Mansfield poster for an example. Occasionally, a traveling circus or a Punch and Judy show entertained the people of Tucson. Learn about the Punch and Judy shows and share your learning as an oral report to other students. Learn more about the Punch and Judy shows. Father Eusebio Kino founded the San Xavier Mission, located on the Tohono O’odham Reservation. Research Padre Kino and write a brief biographical sketch about him and his missionary work in Primeria Alta as southern Arizona was known during Spanish rule. Fill the gallon plastic bag half full of ice, and add the rock salt. Seal the bag tightly. Put milk, vanilla, and sugar into the quart-size plastic food bag, and seal it tightly. Place the small bag inside the large one, and seal it again carefully. Shake until the mixture is ice cream. This should take about 5 minutes. Wipe the ice and salt off the small bag, and then open it carefully. Optional: Transfer ice cream into a cone or a dish, then dig in and enjoy!